If you haven’t caught on by now, I’ve got a lot of butternut squash around my house at the moment. I even found more in the trunk of my car that I hadn’t unloaded yet! Good thing it hasn’t been so hot that it got roasted or moldy! 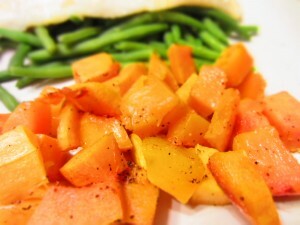 For this side dish I did the normal roasting of the butternut squash-nothing new, right? Wrong, I decided to roast it a bit longer than normal and add some spices to make it a wonderfully warm and satisfying side dish. I made even had this as a “dessert” one night because it took on the flavors so well and it was so creamy it almost tasted like a pumpkin pie!!! This is such a great side dish. If you add these simple ingredients you can wow your guests, enjoy it with your family, or on your own with this twist on a simple side. Chop up squash into approximately 1 inch cubes. Put in a jelly roll pan, drizzle with oil, toss. Sprinkle with salt, nutmeg, and cinnamon. Feel free to add more of the spices if you have a bigger squash. Make sure not to over salt! Bake in a 400 degree oven for 35 minutes or when it gets to the point where it is easily pierced with a fork, leave it in a few more minutes. This way you get a really creamy squash. Serve warm (not hot! you can taste the flavors better when its cooled off some).